Appearing most often with pianist Melanie Foster Taylor, Ensemble Radieuse performs regularly throughout the Southeast; they have played to great acclaim in England, Jordan, Panama, Michigan, Texas, West Virginia, and Pennsylvania, as well as at New York City's St. Patrick's Cathedral and on Nashville Public Radio’s “Live in Studio C.” In 2006 they were prize winners in the National Flute Association's international Chamber Music Competition. Ensemble Radieuse’s premiere CD, Inbox, was released in spring of 2003. 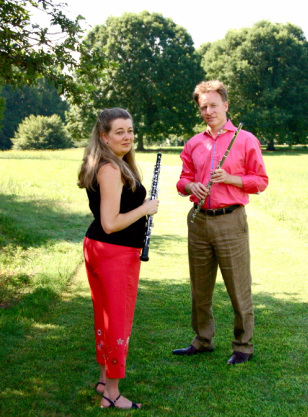 A compendium of attractive new music for flute, oboe, and piano, Inbox contains several pieces commissioned by Ensemble Radieuse—Greg Wanamaker’s Triaria, and Tim Grundmann’s Junk Mail, both for flute, oboe, and piano, and Scott Robbins’ Sonata for flute and oboe. One of our most favorite arrangements is our arrangement of Maurice Ravel's ​Le Tombeau de Couperin. Here is the final movement, the Rigadoun, as premiered by Chris and Kelly Vaneman and pianist Melanie Taylor. Our CD Inbox is available for purchase directly from us ($15)--please contact us at kelly.vaneman@converse.edu. 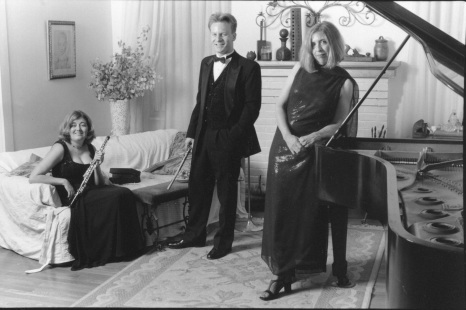 Here are two of our favorite selections from the CD--the sublime second movement to Madeleine Dring's Trio for flute, oboe, and piano; and the opening movement of Timothy Grundmann's hilarious Junk Mail (one of many ER commissions).